Happy Monday! We continue with a look at some mysterious upcoming projects. 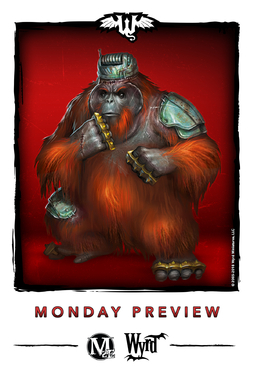 Now speculate away on what monkey-business this model might get up to! Groovy! From the looks of it, he might be some kind of Yokai on steroids...or maybe just a new buddy for Marcus. Either way, looks awesome! Marcus: "How can we make this dangerous beast even more dangerous?" Ramos: "A new electrical brain, I can make a master of martial arts"
Ironsides: "Brass knuckles. For the feet too"
Do you want Grodd!?!? This is how you end up with Grodd!!! Guys, stop monkeying around, this is a seriously amazing preview! I have grape expectations for this model. I will name him Furious George. Also, is he a regular cyber orangutan or a cyber skunk ape? If the latter he could be Gremlin model. Sparks got creative with the local fauna. As someone who is pro-education, I'm glad to see Beast Academics get their opportunity. Harambe is out for revenge. Hah this is going to be awesome for McMourning as well, gotta have that lobotomized ape! But why an orangutan? They're the "Dude" Lebowski of the Great Ape Kingdom! You monsters! Oh hey, someone found Geoffrey. We must tell Professor Elemental at once. Bring me my time travel trousers! Mentally enhanced skunk ape... Cool! 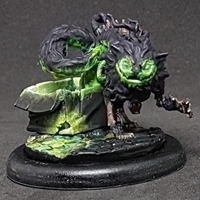 Outside of a few crews, there's not a whole hell of a lot of steampunk in Malifaux. There's a lot of other Victorian era stuff happening in Malifaux and this model seems like it fits right in with Victorian era horror. You didn't happen you ever play City of Heroes did you? The Monkey Fight Club that was occasionally going on in the background at Pocket D was pretty cool. Nope. I did however play Feng Shui/ Shadowfist, as did Bizzrak, I suspect. I surely can't be the only one hoping this is an alt-sculpt Librarian. I thought it had kind of a Frankenstein or Island of Doctor Moreau kind of vibe to it. I think it looks more like a character for Through The Breach roleplaying game rather than a Malifaux miniature. It's for a new Faction called Hats. He's a Master, the Dandy Dead are Minions. I hope that next week we'll see the Henchman and then the Mascot for the first starter for the Hats Faction.